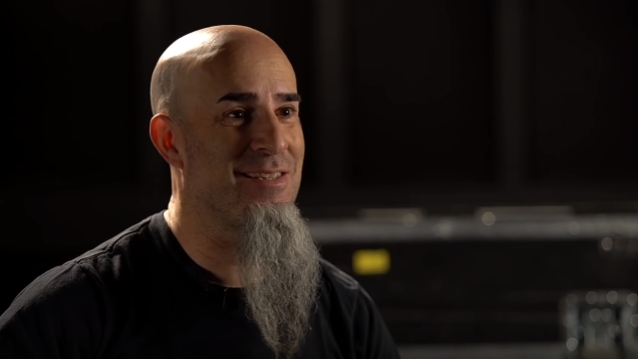 Gretsch has rolled out two new videos with ANTHRAX guitarist Scott Ian in support of the all-new Gretsch G6131-MY Malcolm Young Signature Jet. The first is a shorter piece with more playing to demo the guitar, while the second is longer and goes into more depth. "There is just an instant rush anytime I hear AC/DC," said Ian. "It's like mainlined into my brain. As soon as I hear him playing chords, I just get excited, still, after all these years. If I put on 'Let There Be Rock', I feel the same now as I did 40 years ago. It moves me in exactly the same way." As a young teen, Ian actually learned how to play rhythm guitar by listening and playing along to Malcolm, whom he considers the greatest rhythm guitarist of all time. And given the chance to plug in his hero's new signature model to a vintage Marshall amp and let loose, he was all in. "Look, I don't get to play big open chords in my band," he continued. "My band is all about down picking and palm muting, fast alternating — a completely different style of rhythm playing. So, when I get to hit really big chords and dig in, it is so much fun for me because it is the opposite of what I do. But it is what I grew up learning how to do. And it's what I still love, going back to that. Anytime I can just pick up a guitar that sounds so good and feels so good, and then play chords that sound perfect, I could do it all day. It makes me happy. I could literally sit for an hour and play that A chord over and over again and not get bored." After some lengthy playing indulgence, Gretsch asked Ian to describe the sound he was getting out of the signature Pro Jet. "There's like this splash when Malcolm hits a big old chord and lets it ring out," described Ian. "He digs into the chord and that sounds comes at you. It's like a giant wave coming at you, and then it crashes. And then another one, and then another one. And this has that feeling. When you dig into that chord, you feel the amp react. You can like, literally feel the tubes. You feel it. You feel that swell of volume, and then it pulls back. And then you hit another one. It makes you really feel like a part of it. It's that swell, that wave, that splash of his tone, and this sounds exactly like that." The number of artists who consider Malcolm Young an inspiration runs pretty deep, but we're guessing not too many have gone so far to actually have his face inked into their own skin. Ian, though, has immortalized the late-great rhythm guitarist on his left bicep, along with his brother Angus Young on his right. "Specifically, these guys, as a guitar player, mean everything to me," explained Ian. "That's why I really wanted them on me because it makes me happy to be able to look at them every day. "Malcolm has always been my hero since day one because he basically taught me how to play guitar," Ian said. "As a kid with AC/DC albums, vinyl albums, in my little bed room on a turn table, I just used to sit and figure out how to play their songs. And it was all Malcolm. You know? It was all him. So, I was learning to play specifically by listening to what he was doing. He was my guitar teacher. He was the reason I learned how to play rhythm guitar the way I do." For more details on the G6131-MY Malcolm Young Signature Jet, go to this location.